News + Events — Trauma-Informed Acupuncture, Yoga and Sound Healing in Portland, OR. Information about Acupuncture, Sound Healing and Yoga in Portland, OR with Kate F Busby. This retreat has become the stuff of lore and legend, yoga-lovers venturing far afield to the wild, off-grid jungles of the bio-diverse Osa Peninsula in Southwestern Costa Rica for 8 nights of renewal, replenishment, and joy. The environment alone is worth the trek to see all manner of monkeys, sloths, exotic birds and more, but pair that with twice-daily yoga practices adapted for group level and time of day, beachfront meditation, Ayurvedic self-care rituals, pranayama and restorative yoga sessions and more with Lisa Mae, Kate and Danielle, plus all your delicious, healthy, whole-foods meals thought up and made fresh by local chef Lily Murillo Abarca, and you have the recipe for major life overhaul. 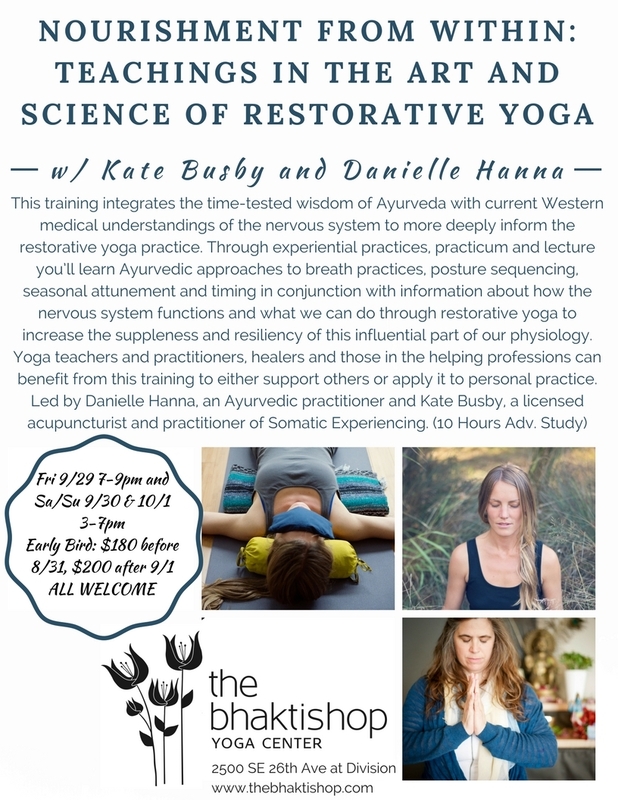 If you're feeling like you could use a little more basic sanity and sense of self in this crazy world consider joining me and my friend and colleague, Danielle Hanna, an Ayurvedic practitioner and yoga teacher as we explore the potency of the restorative yoga practice over three days. Teachers, wellness/mental health professionals and yoga practitioners welcome. Space limited. Venturing into the darkness, the unknown, we often lose our bearings. The surface identifiers of our lives, what we all too often build our sense of self around, are eclipsed by the power of night, leaving us to ask: Who am I, really? Like our yoga practice, the darkness is a container for transformation, a chrysalis. It’s a sacred space we can dip into to know ourselves for who we are underneath all the “stuff” that can obscure our ability to see ourselves and our lives clearly. In the good company of fellow seekers and with the beautiful backdrop of live shakuhachi flute music from Beau Vandendolder, we will practice by candlelight, combining fluid, breath-based vinyasa, restorative shapes and pranayama to invoke and integrate what is most essential. December 19th, 7-9pm at The People's Yoga NE. Register here. Do you want to learn about how to get more out of the yoga poses you do in class, or how to feel better while you do them? Foundations II is a 6-week series that takes apart and teaches the elements of sun salutations, balances poses, inversion preps and more in an inclusive environment with lots of room for questions.